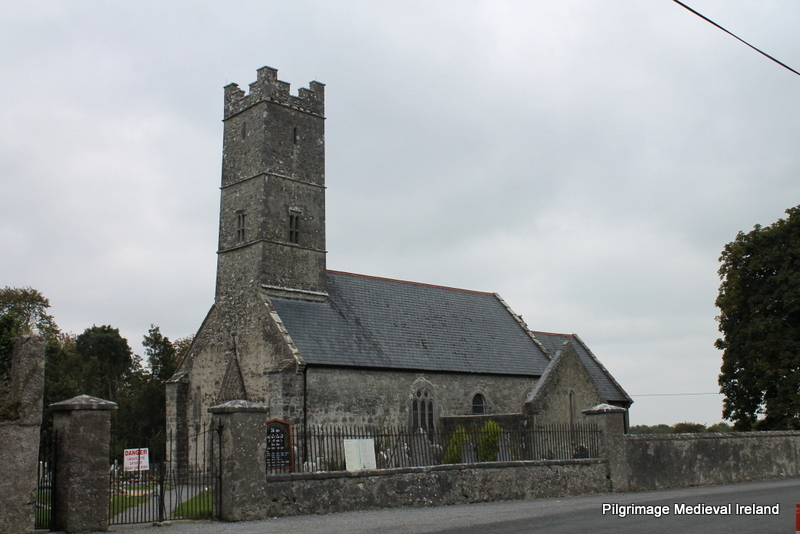 Last Sunday I paid a flying visit to the medieval Cathedral at Clonfert Co Galway. Clonfert Cathedral was built on the site of an early medieval monastery founded by St Brendan the Navigator circa 557 AD. 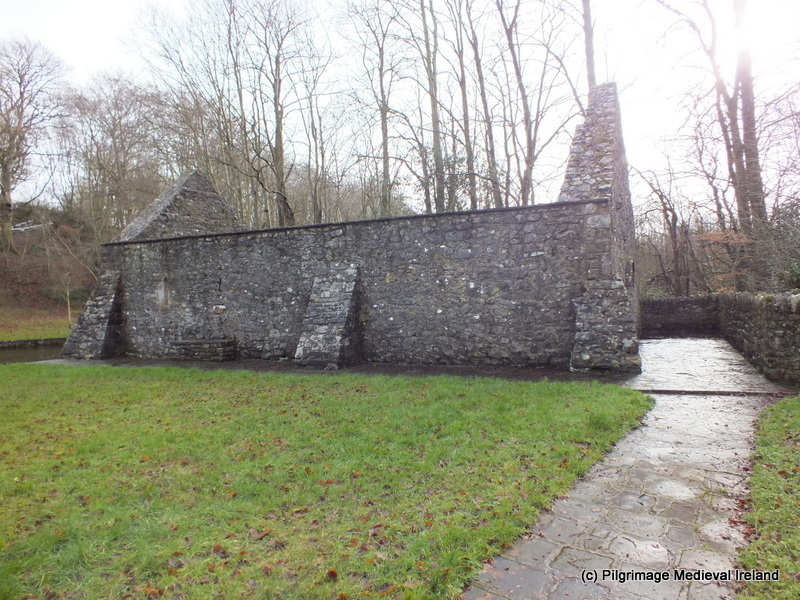 The history of Clonfert and its architecture is really interesting and I will come back to it again but for this post I want to focus on a lesser known feature at the site known as St Brendan’s rag tree. The tree, a horse-chestnut, is located in a grove of trees beside the medieval church along the nuns walk. This is one of the most impressive rag trees that I have come across. It is covered in votive offerings. St Brendan’s rag tree at Clonfert. The following text was written by Christy Cunniffe for the South East Archaeological and Historical Society Newsletter for Spring 2012 and provides an excellent discussion of the tree and its history and folklore. 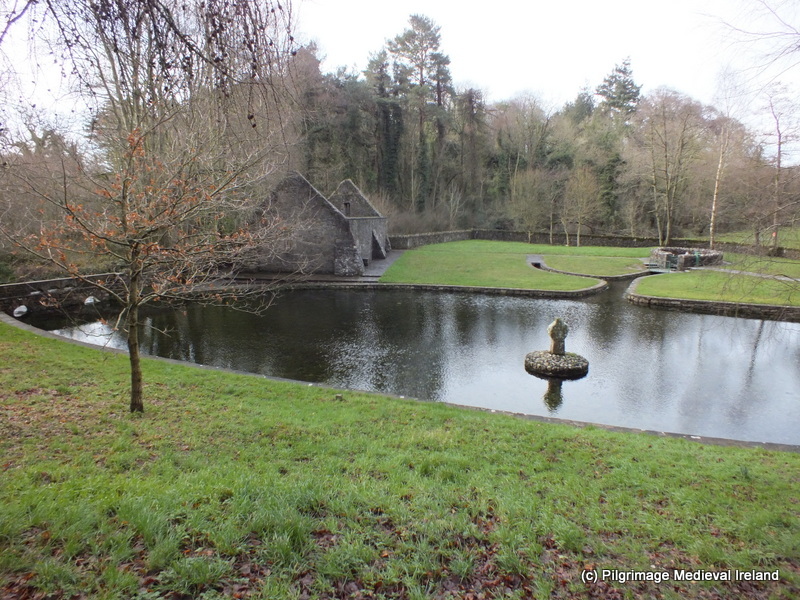 cathedral at Clonfert consists of a holy well dedicated to St Brendan. dried up as is usual for wells that are interfered with in some way . 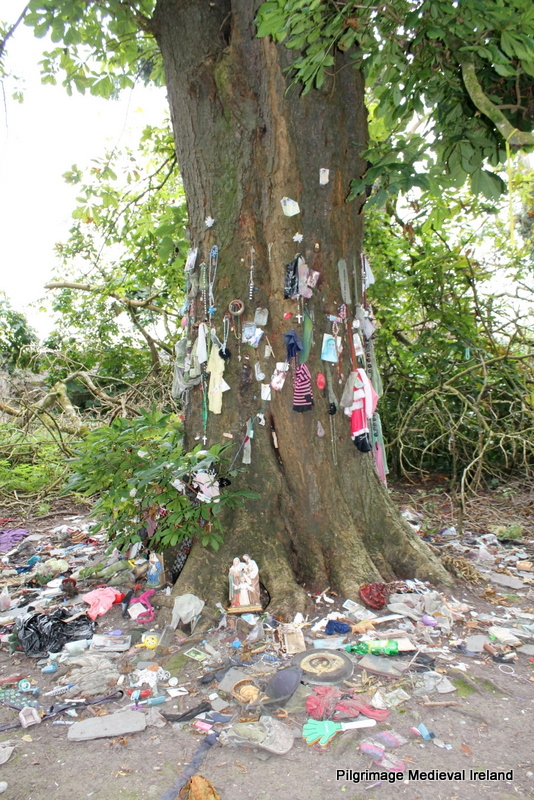 Offerings pinned to St Brendan’s rag tree at Clonfert. The offerings pinned to the tree are varied. They range from rosary beads, hair bobbins, sockets, babies dummies, religious statues and children’s toys and brown scapular. 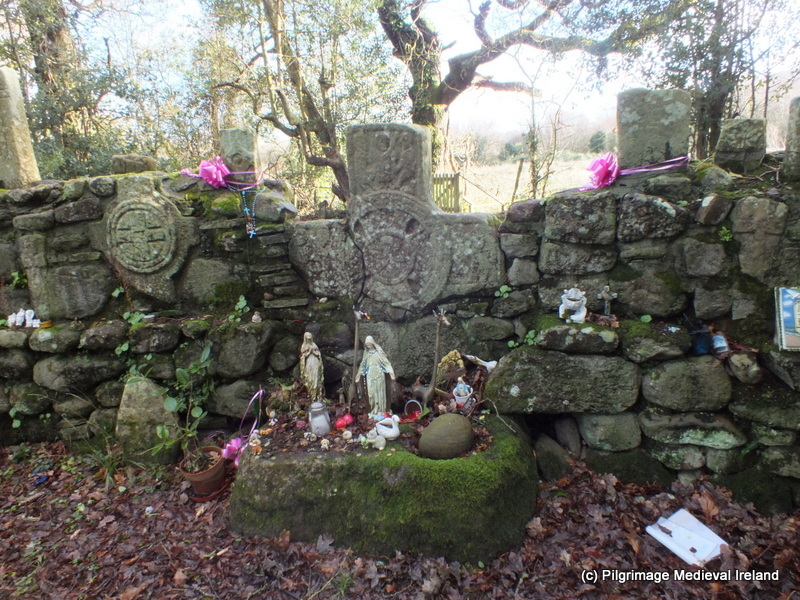 Votive offerings surrounding St Brendan’s rag tree at Clonfert. The base of the tree is surrounded with a circle of offering some may have fallen from the tree but others are likely placed here on the ground. 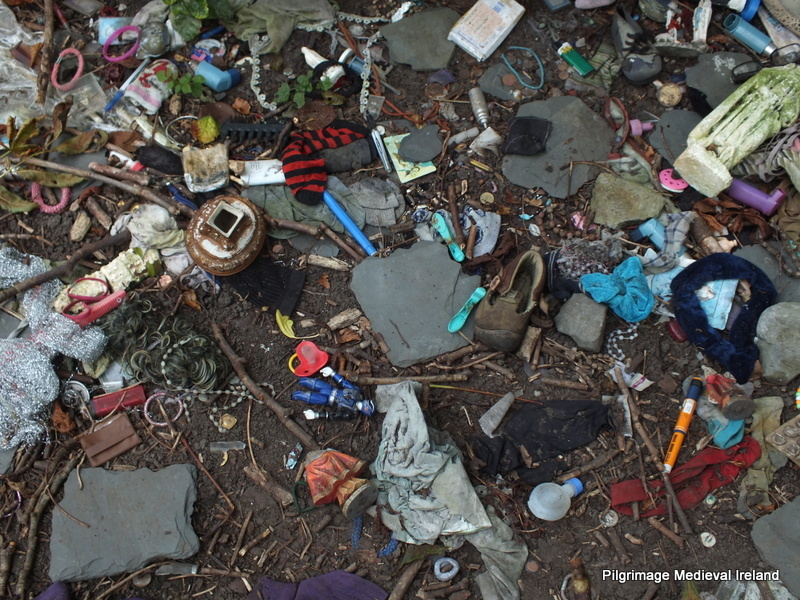 These offering are similar to those pinned to the tree although I notices more items of clothing, religious statues, inhalers, containers for tablets and holy water bottles. The volume of objects is astonishing and shows that there is still a great devotion to the tree. Cunniffe, C. 2012 ‘St Brendan’s Tree, Clonfert’, South East Archaeological and Historical Society Newsletter, No 9, Spring, 2012, 2. 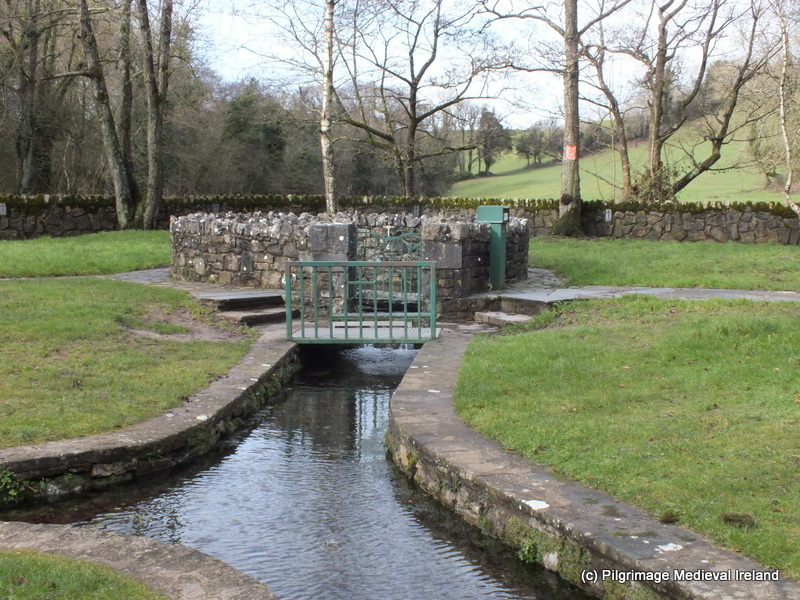 The Rag Well is a small well located in the townland of Knocklucas, on the southern outskirts of the town of Clonmel. 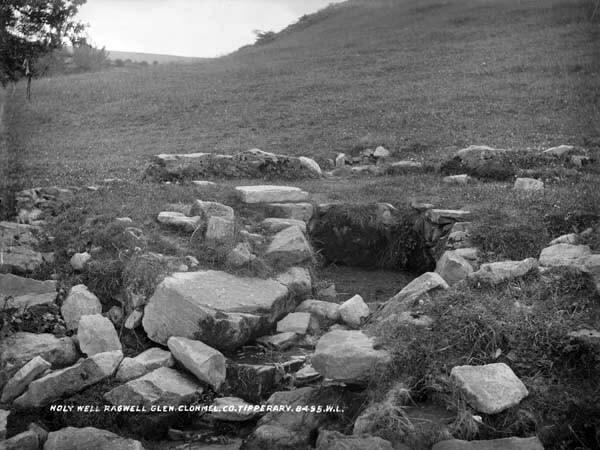 The well gives its name to the surrounding area which is generally referred to as the ‘ragwell’. This is not a holy well it is more of a wishing well and there is a long tradition of people coming here and tying rags to a white thorn tree beside the well to make a wish . 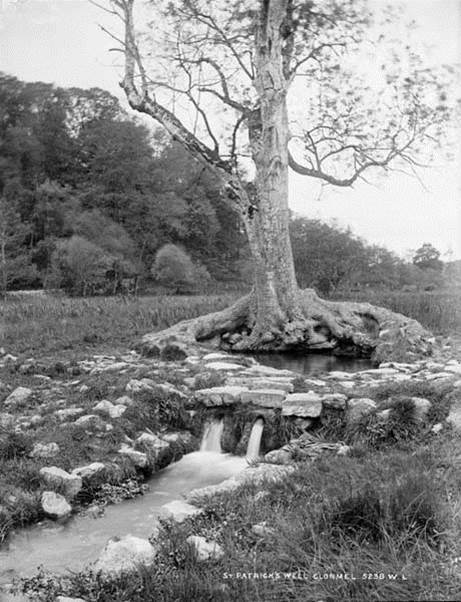 While writing my last post on St Patricks well at Marlfield I came across some old photos of the Rag Well in the National Library of Ireland online photographic database. I became very curious about the well, its history, if it had changed or had been refurbished. So last weekend I paid a visit to the site with my uncle Eddie who grew up in the Old Bridge area of Clonmel town and as a child visited the site. 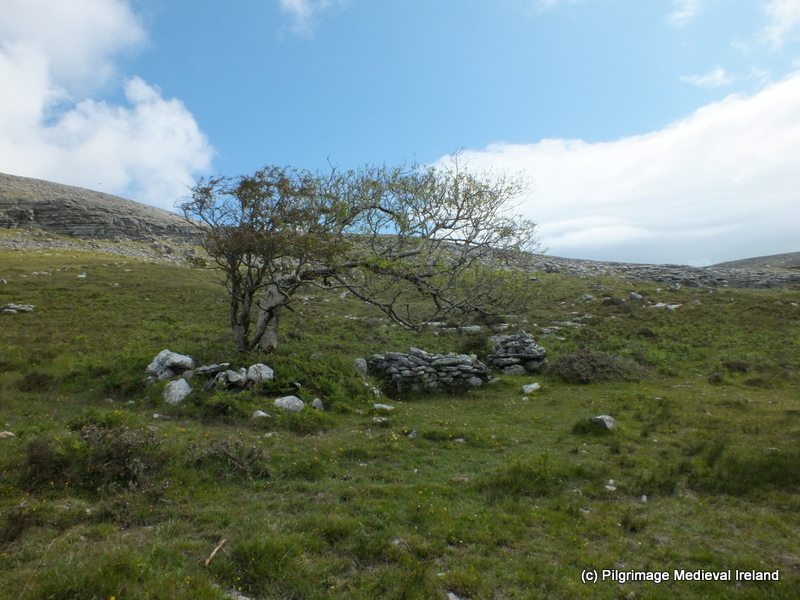 In 1841 John O’Donovan records that the well as being known as Tobar na Gréine / the well of the sun. Although he refers to it as a holy well, he makes no mention of pilgrimage or an association with a saint. 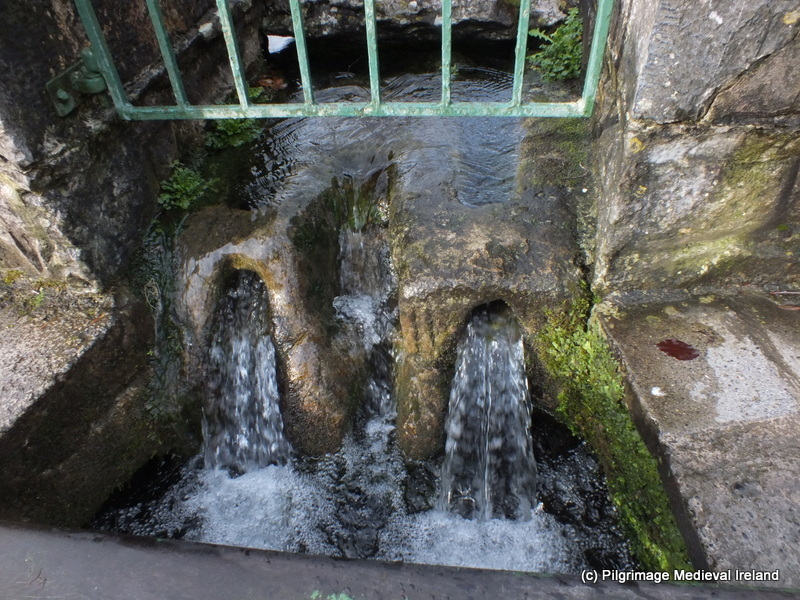 By the early 20th century the well was known as the Rag Well and continues to be known by this name to this day. The well is an underground stream which flows into a stone lined channel. 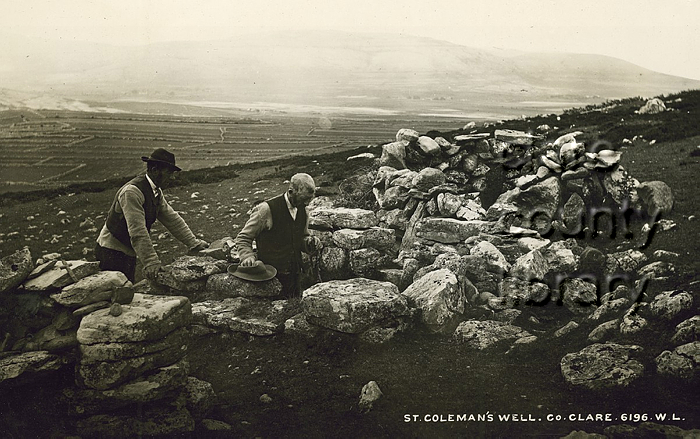 At the time the photo below was taken in the early 1900’s the well was surrounded by a low circular wall. The enclosing wall was in poor condition and it looks like only the footings of the wall were visible when the photo was taken. 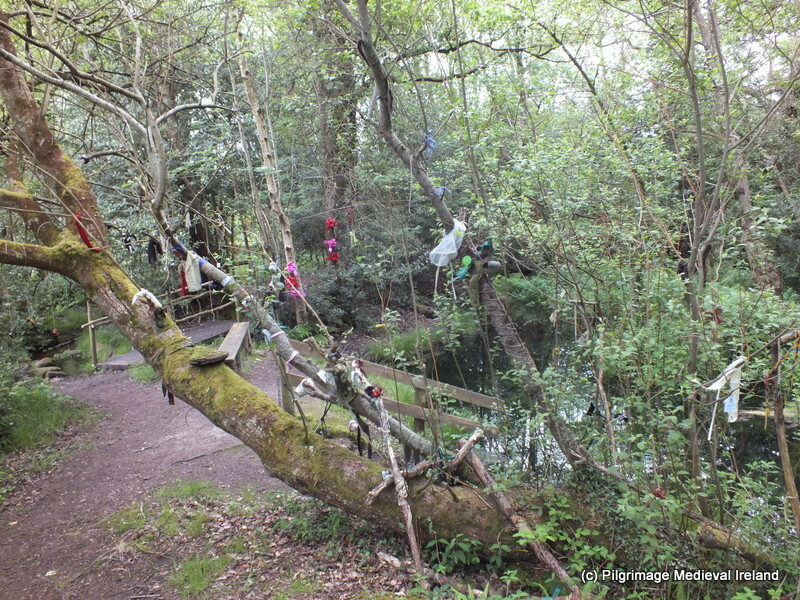 In the photo the white thorn tree beside the well is covered in rags. 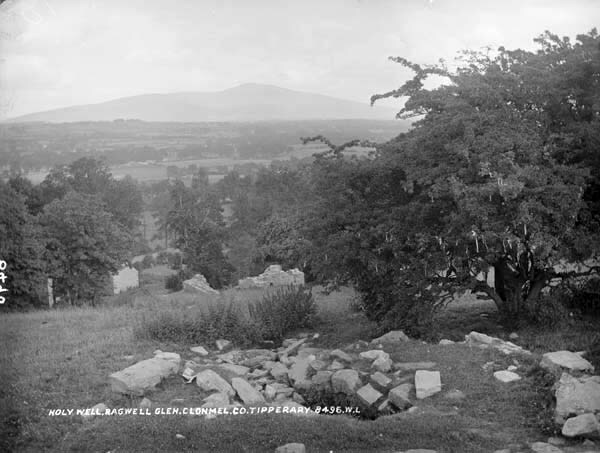 The well looks directly across at Slievenamon mountain and the mountain is was clearly visible in the photo above. The modern tree coverage is alot more dense and the view is not as clear but its still pretty impressive. 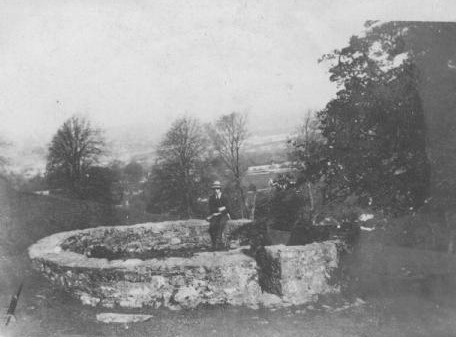 A later photo, of unknown date, shows that the wall around the well had been rebuilt and the well has remained unchanged to this day. To get to the Rag Well you head out of Clonmel along the mountain road and at the first junction, on a sharp bend you take the smaller road (see map above). A short distance up this road you will see a small green gate that opens on to an old grassy laneway. 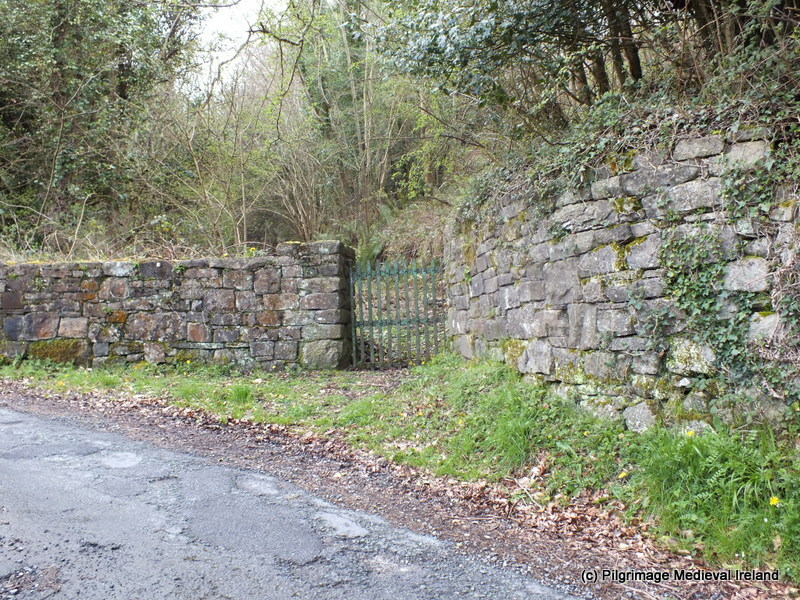 Go through the gate and the path to the well is on the right hand side above the lane. It is easy to miss the path and you have to climb up to it. 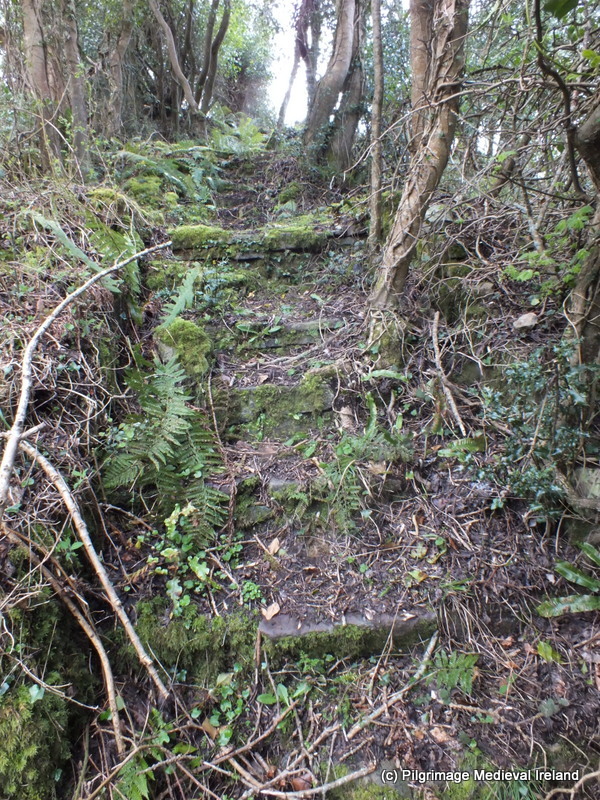 The path consist of stone steps which are now covered in leaves and dirt. 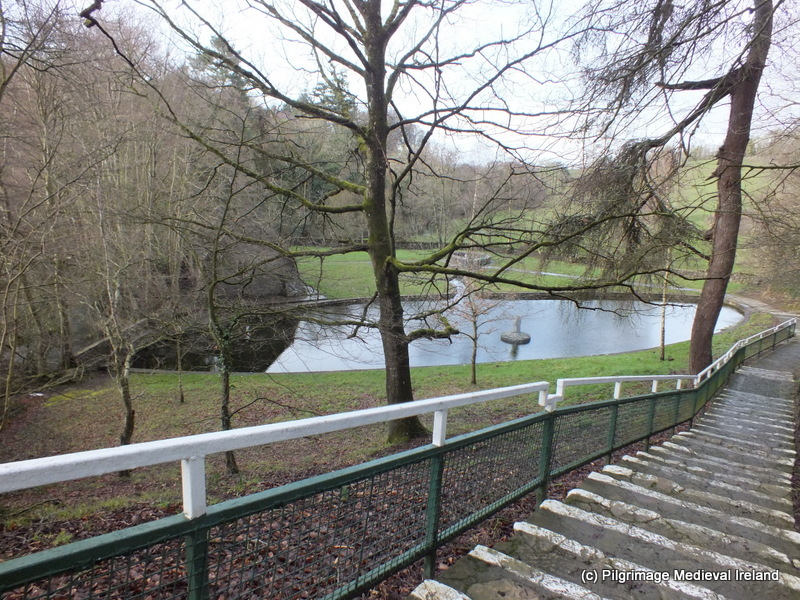 The steps are very slippy so do take care climbing and if you are anyway unsteady on your feet id give it a miss, I stumbled a few times on the way up and down. The path is a little bit over grown in places but it will lead you to the well. Like the path the well is neglected and over grown. 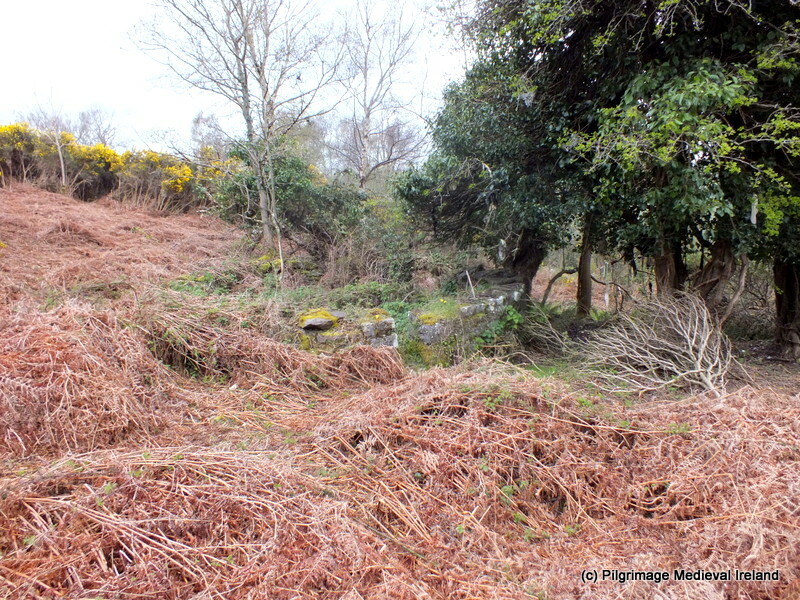 In the older photos the well was surrounded by pasture but today the field is covered in bracken and gorse. The well is still surrounded by the circular stone wall. The wall is in a reasonable state of preservation but there are patches in need of repair. The well can be entered through a small opening in the south. 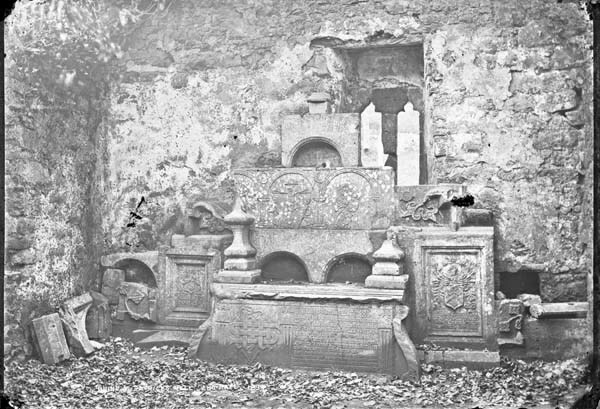 The interior is now very over grown, although it is clear the interior hasn’t change since French photographed the well in the 1900’s see photo below. The water flows out from the ground into the stone channel which in turn flows out of the enclosure and heads down hill. The rag tree which is a white thorn tree is covered in ivy. It looks like the ivy is choking the tree which is really sad given its history. 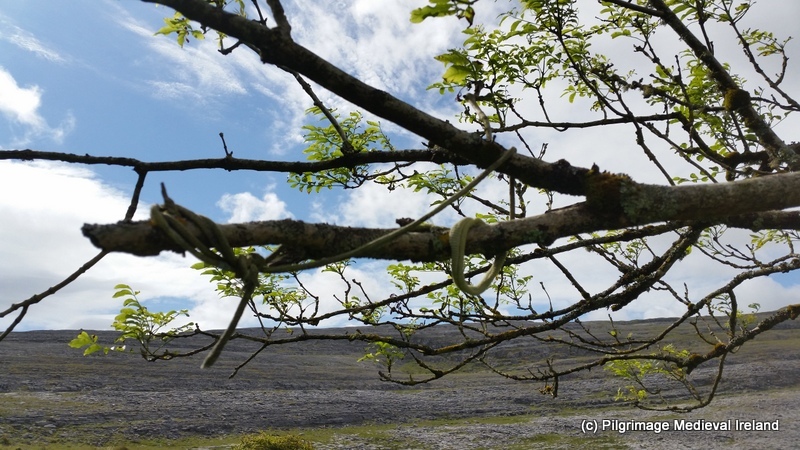 There are still some rags on the tree which suggests some adventurous people still come here. The Rag Tree which gives the Rag Well its name. As a child my uncle was told the well was associated with the fairies and he and his friends would tie rags to the tree to make wishes before heading off to the near by reservoir to go for a swim. Id love to hear from anyone who has any memories of the rag well and I hope this post will encourage people to visit it so this magical place does not become forgotten. O’Connell, P 1956. 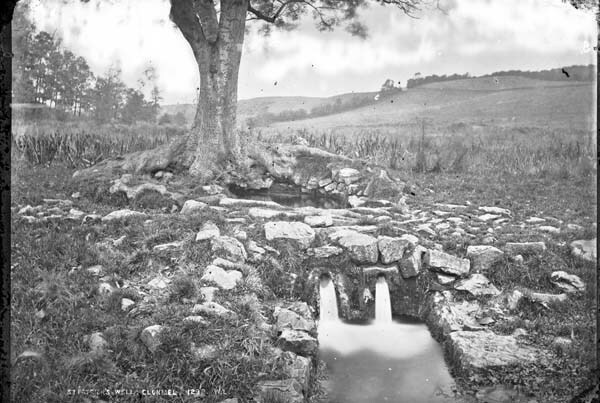 ‘St Patrick’s well Clonmel, Co. Tipperary: an early Christian sanctuary of the decies. Phamplet . 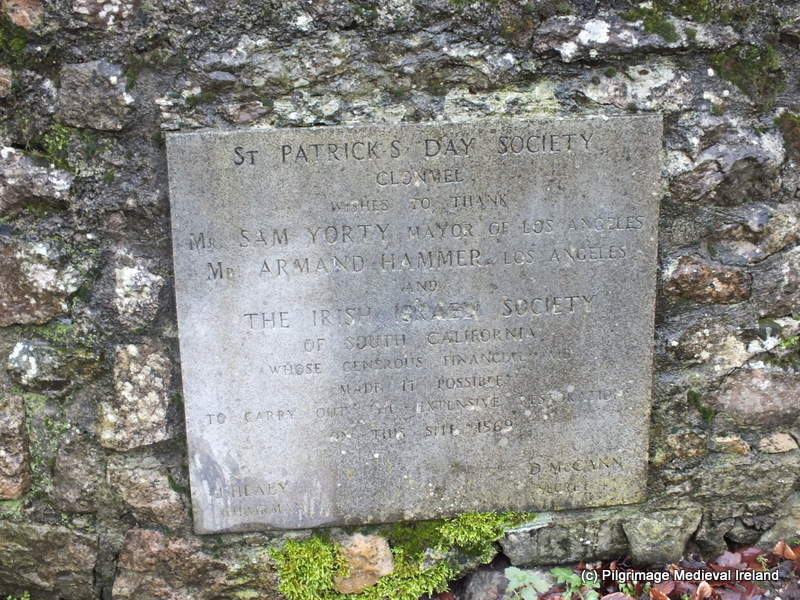 Clonmel: St Patrick’s Day Society. O’ Flanagan, Rev. M. (Complier) 1929. Letters containing information relative to the antiquities of the county of Waterford collected during the progress of the Ordnance Survey in 1841. Bray: Typescript. From the main road, you will see a sign for “Golden Mile, Winner 2003”, turn left on the opposite road. Half a mile down this road is a gate with a no parking sign. Go through this gate and cross the first field (Be aware that there might be cows or bulls!). 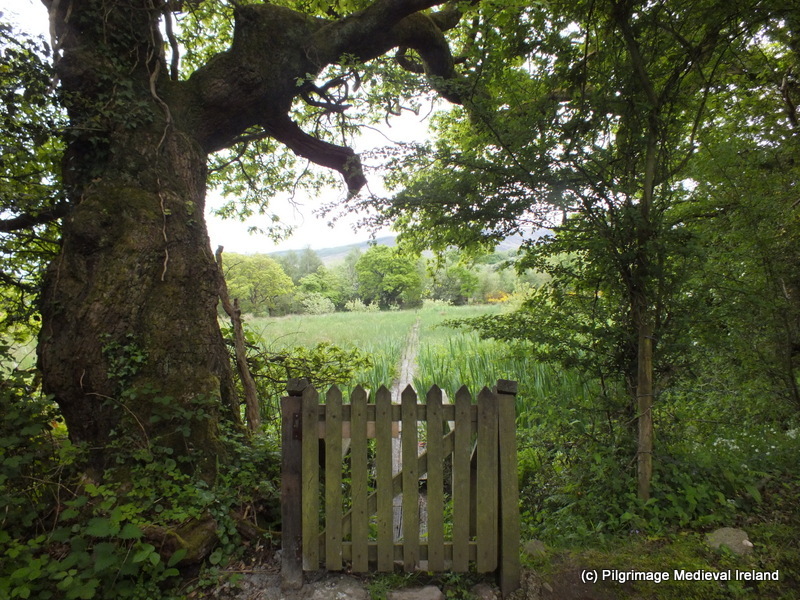 From there you will find the wooden trail that will lead you to the Kyle and the Well (visitballyhoura.com). It is suggested that St Berrihert came to Ireland following the Synod of Whitby (Ó HÉaildhe 1967, 104). He is named in some documents as brother of the Saxon saint Garailt of Mayo (Ó Riain 2011, 103). 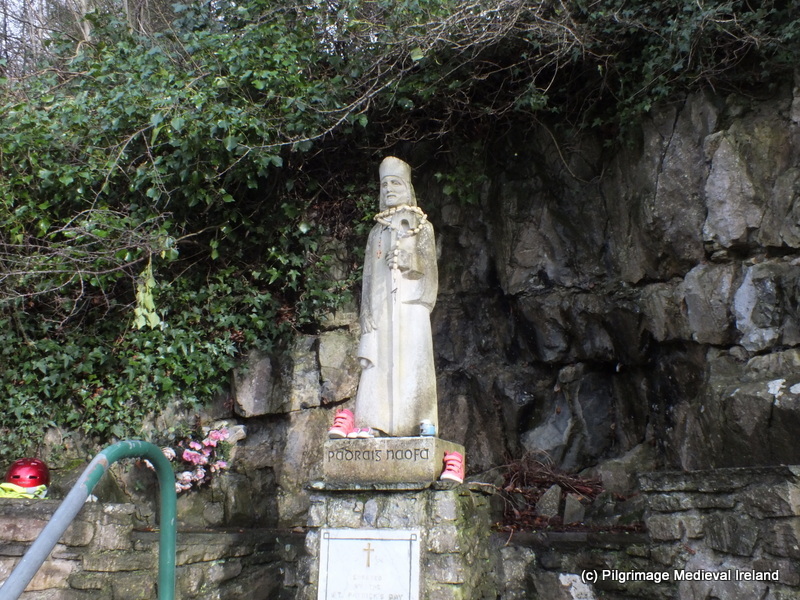 He is associated with a number of places in the south of Ireland mainly around Co Cork. 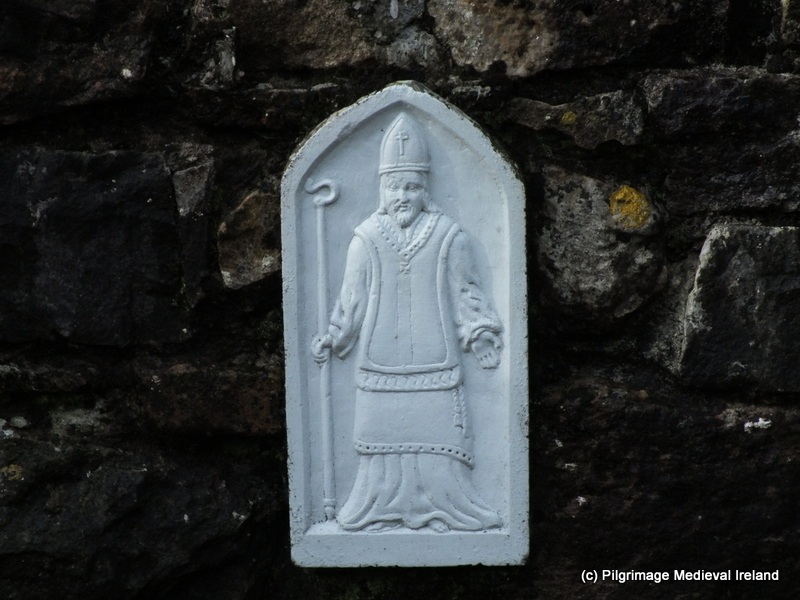 He is likely also to be the same saint as St Berichter the patron of an early medieval ecclesiastical site at Tullylease in the barony of Duhallow, Co Cork. An interesting cross slab of 8th/9th century date survives at Tullylease. 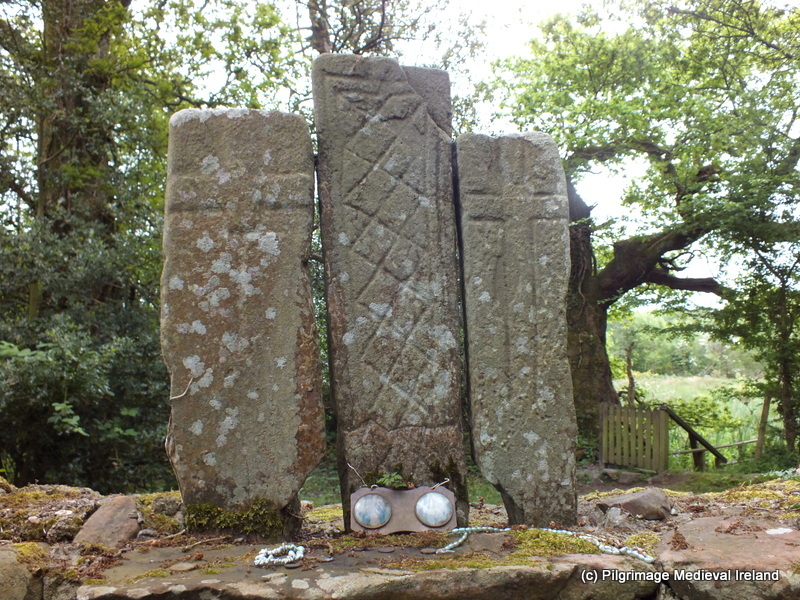 The stone has an elaborate decorated cross and the text of with a prayer for Beirchachtuire an Irish version of the Anglo-Saxon Beorhtwine. Berichtir of Tulach Leis died on the 6th of December. The Martyrologies of Donegal and Gorman record the saint feast day as the 6th of December. His feast was honoured on the 18th of February at St Berrihert’s Kyle, the subject of this post, and at the 15th of February in West Kerry. The variation of feast day perhaps indicates ‘ that the cult had become entwined with that of Bearach of Termonbarry‘ whose feast is on the 15th of February (Ó Riain 2011, 102). 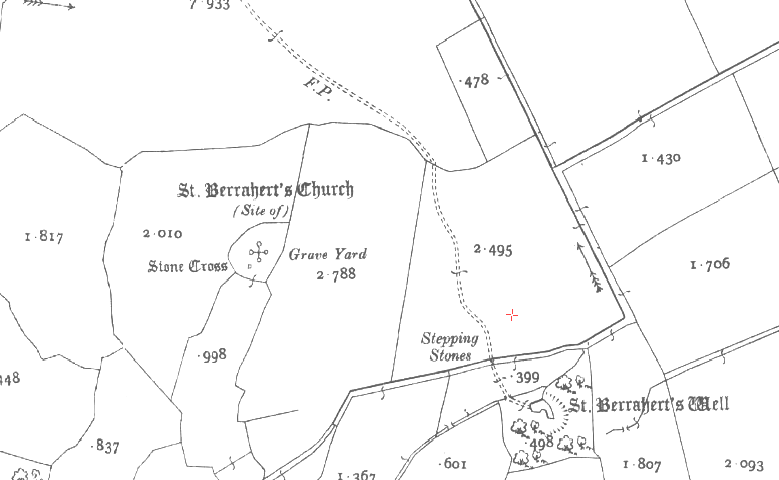 St Berrihert’s Kyle is located on farm land. To approach the site you must cross through two fields. The land is boggy but a timber path marks the way. There are often horses or cattle in the field. The Kyle is the oval area enclosed by an earthen bank and contains a large number of early medieval cross slabs. The landscape of this area has changed in the last 100 years or so. In 1907 Crawford described the area as ‘a circular enclosure in a field west of the well and greatly overgrown with oak tress and thorn bushes‘. He also noted that all the carved stones, which he counted 22 have been collected and built into a station (Crawford 1907, 61). 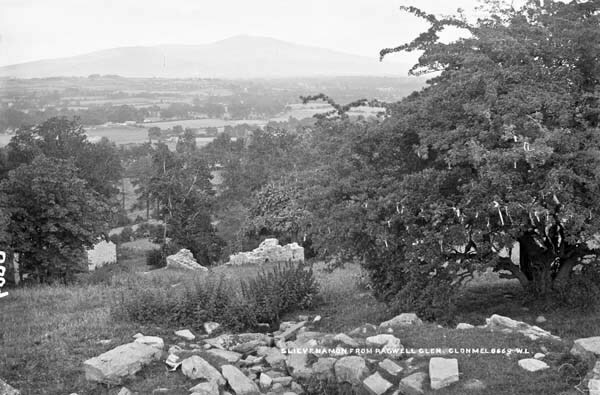 The photo above dates to 1907, it shows the site as very overgrown with a large number of the cross slabs placed in front of a small tree covered in rags. 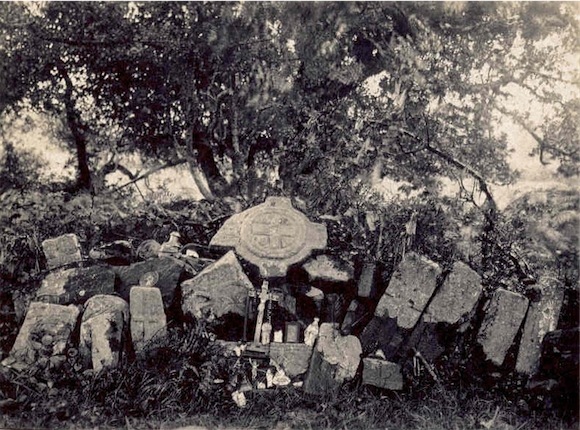 Crawford( 1907, 62) mentions the tree was a thorn-bush and that a series of offerings were left here including statuettes, vases, cups and toy-teapots. A second photo from the Limerick City Museum collection show that the cross slabs had been moved and built up into a station in front of a wall. 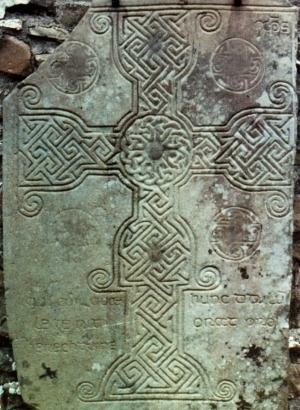 A large rectangular stone was placed in front of the crosses . This photo is dated to between 1896-1910 and on the reverse image in pencil ‘Berrihert’s Kyle Co. Tipp. 1936’. Today the landscape of the site owes much to work carried out in 1946 by the Office of Public Works/OPW who “cleaned up the site”. They cleared the enclosure of bushes and vegetation. 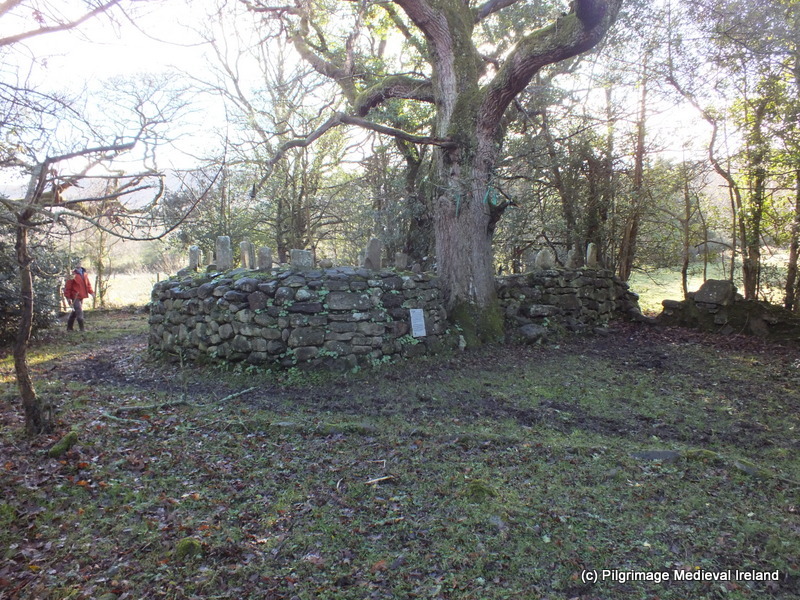 Then they collected all the crosses and built them into a circular stone structure which incorporates a large oak tree, to protect the crosses from cattle at the south end of the site. The walls are full of cross slabs and it has an ancient look to it. The stone structure is entered via a style, beside a large oak tree. Ó HÉailidhe (1967, 103) recorded 72 cross inscribed stone at the site but only 67 were noted by the Tipperary Survey in 2011 suggesting some may be missing. 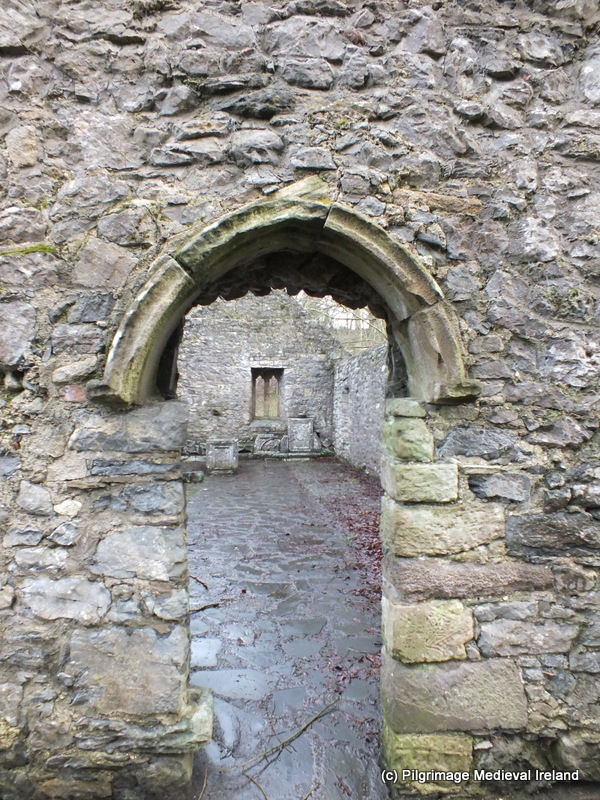 Interior of stone enclosure showing the stone crosses incorporated into the walls. The majority of the crosses depict a simple Latin cross on a single face. A small number have decoration on both faces. 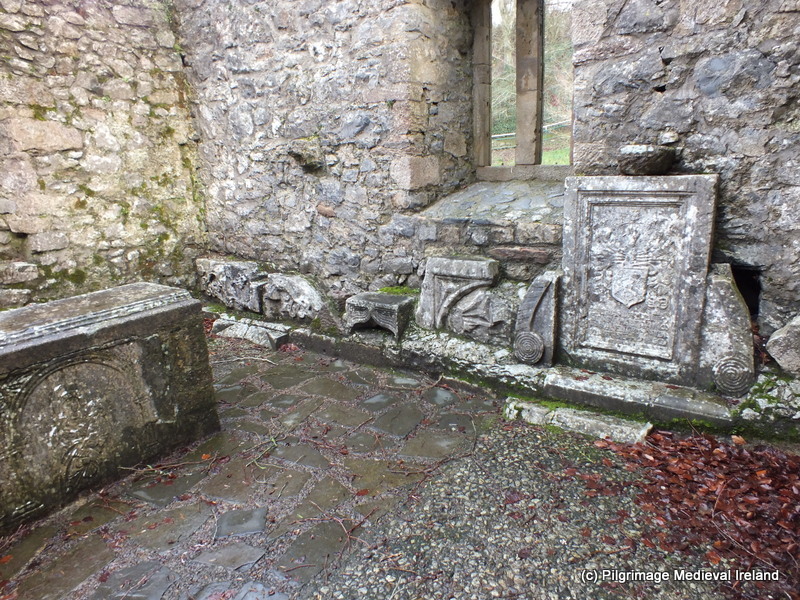 Close up of cross slabs at St Berrihert’s Kyle. A larger rectangular stone with one hollow depression is found within the stone enclosure, in front of the head of a high cross which is incorporated into the wall. The surface of the bullaun stone is covered by trinkets left by pilgrims and includes holy statues, small toys, coins and crystals . A large egg-shaped stone sits in the hollow of the bullaun stone. 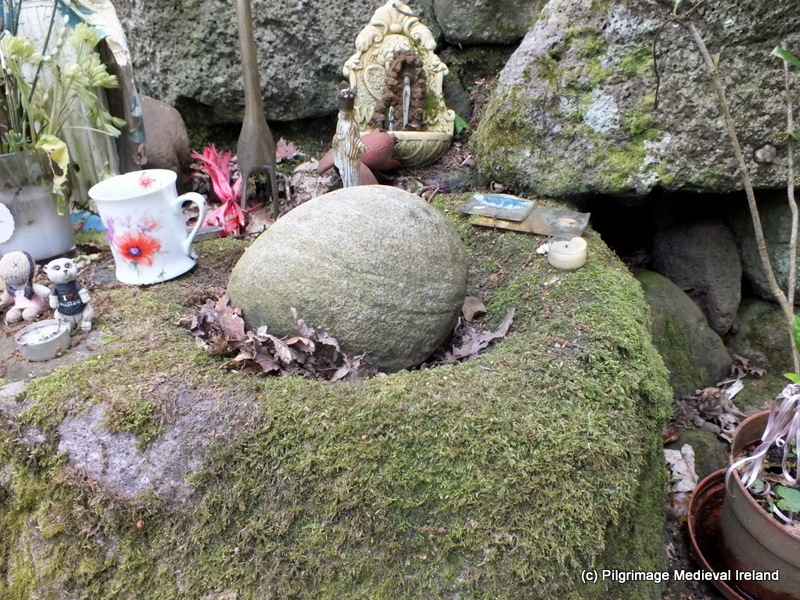 These egg stones occurs at other pilgrim sites and are known as cursing stones. Egg shaped stone in the bullaun stone. 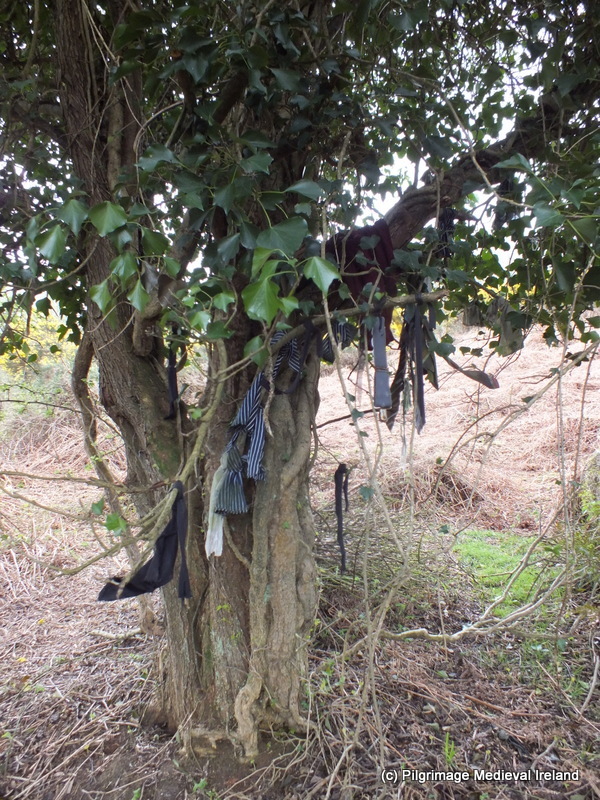 A holly tree within the enclosure is covered rags and ribbons tied by modern pilgrims. Rag tree within circular stone structure at St Berriherts Kyle. 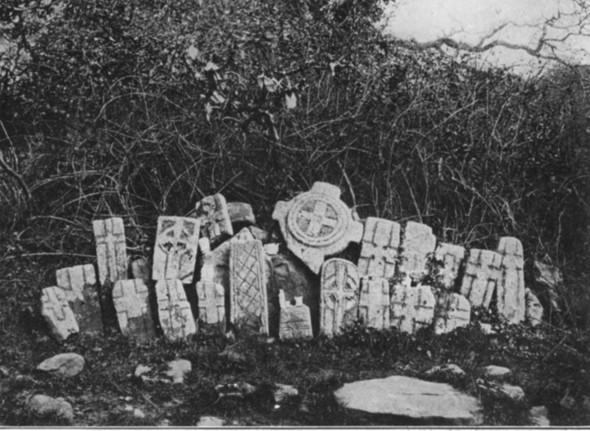 The presence of such a large number of cross slabs at the site may suggest the presence of a monastic settlement. There are no upstanding remains of any buildings at the site. If this was a monastic site it is possible the buildings were built of wood. 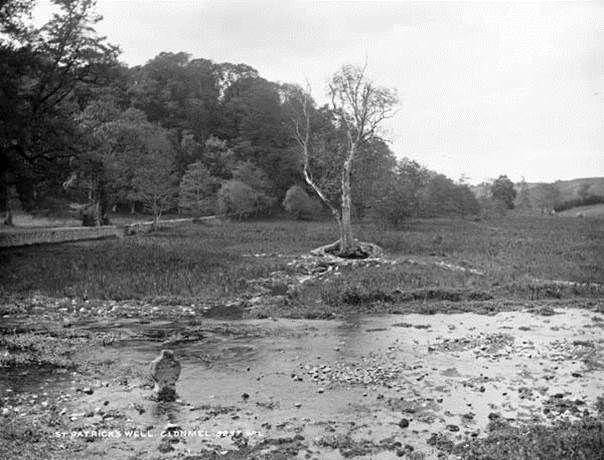 In the 1940’s the ground surface of the Kyle was lowered and the soil from this area was used to build a causeway across the bog to the nearby St Berrihert’s well. 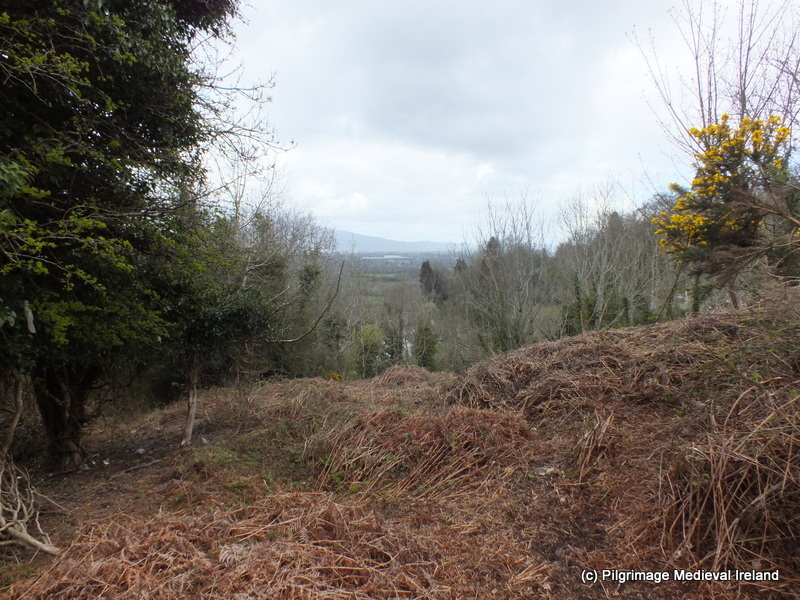 The OPW recorded no trace of walls when lowering the ground level at the site. It is impossible to know what damage this act did to any sub-surface archaeological remains that may have been present. Around the edge of the Kyle are a number of small stone cairns surmounted by a cross slab. These cairns were created in 1940’s to mark stations of the cross but there were not part of the original pilgrim stations at the site . 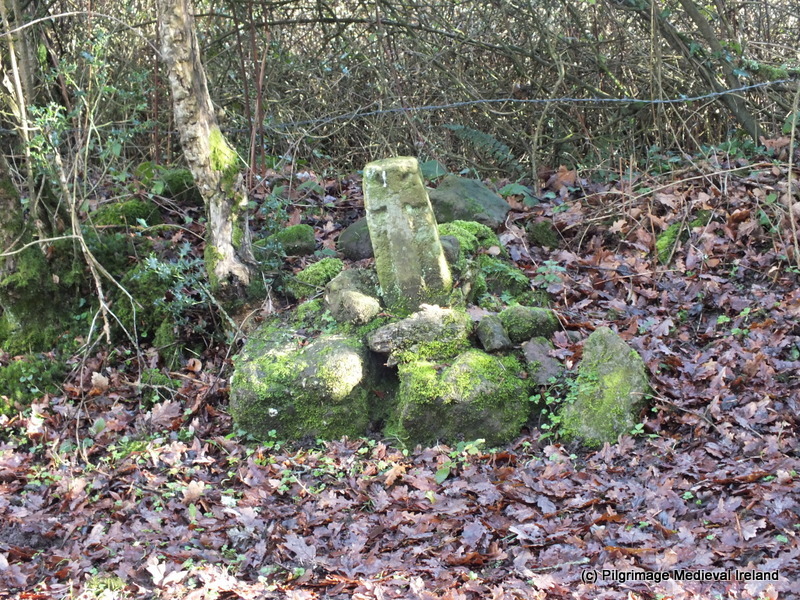 Cairn with cross slab built in 1946. The central area of the Kyle is defined by stone curbing which demarcate a children’s burial ground. 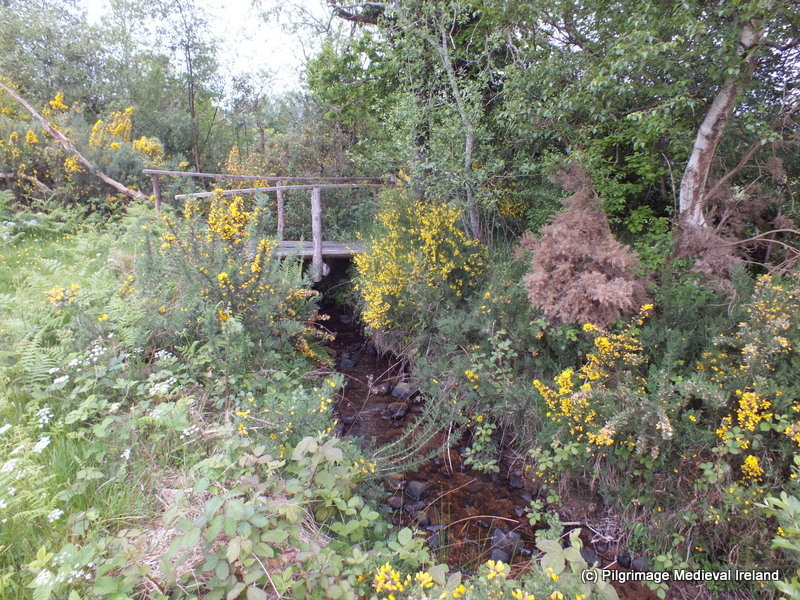 The nearby holy well is dedicated to St Berrihert and is located a short distance from the Kyle. 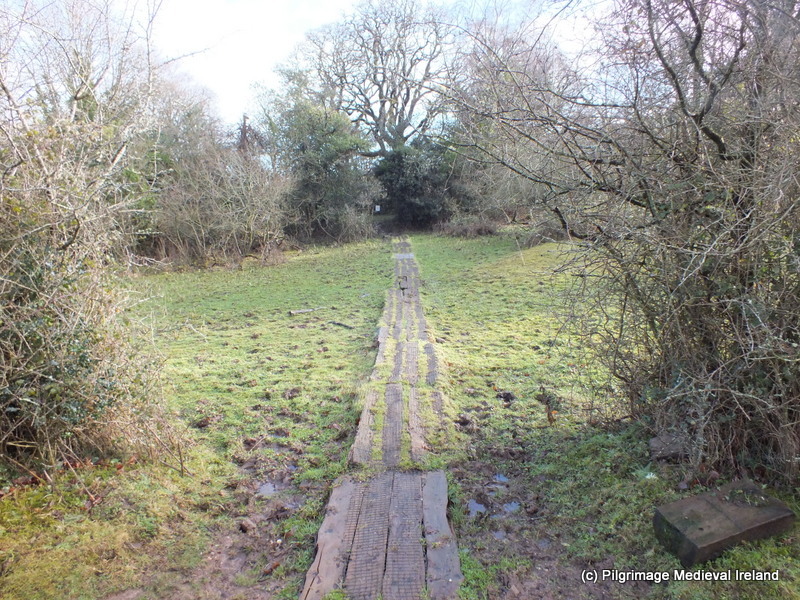 The path is marked by a timber track through marshy ground. 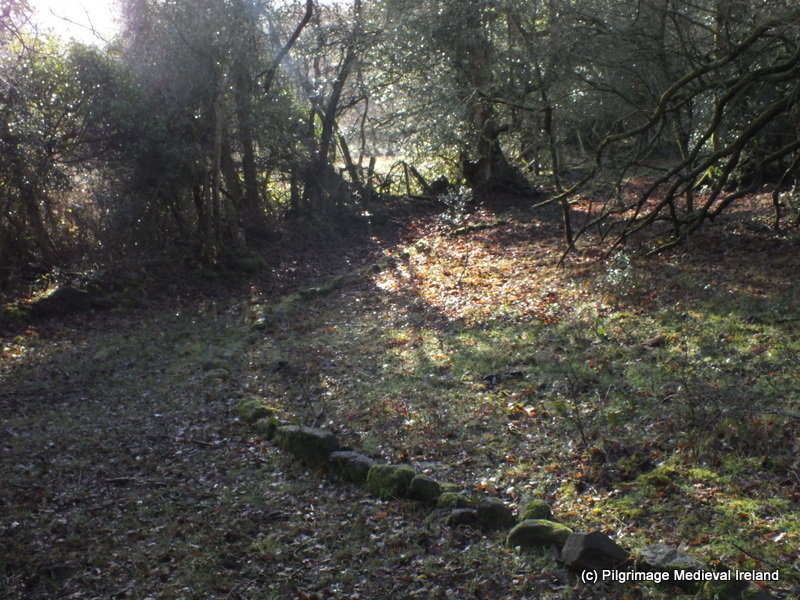 Path leading from the Kyle to the nearby St Berrihert’s holy well. The path continues crossing over a small bridge. 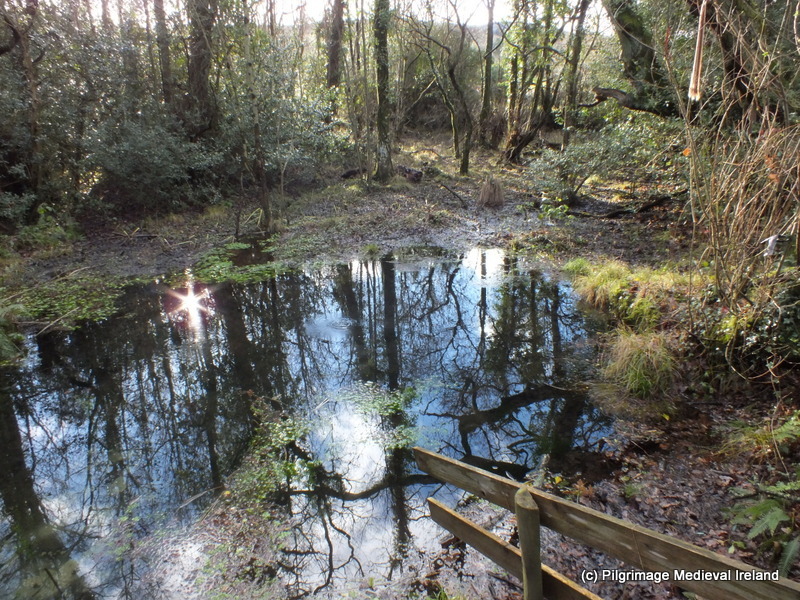 The well is a large circular pool is found in a surrounded by trees and defined by an earthen bank in the NE-NW. 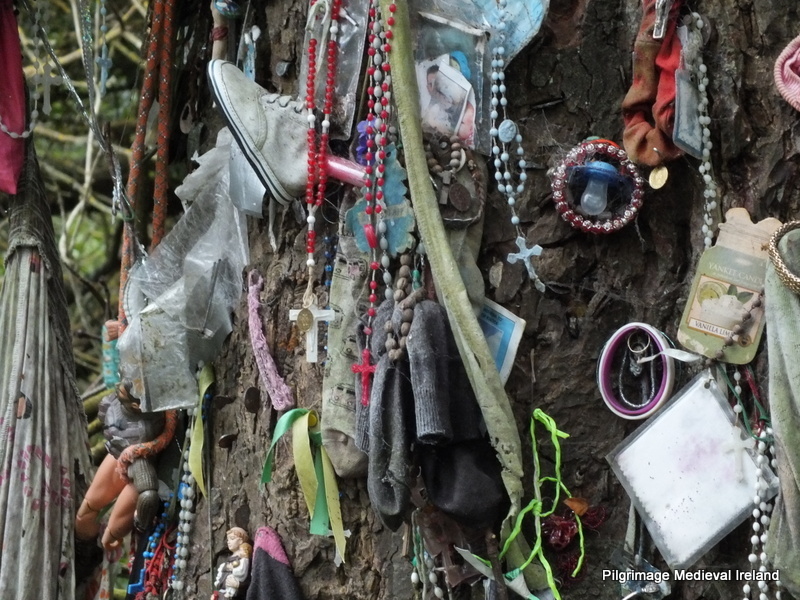 Some of the trees are decorated offering left by modern pilgrims and range from ribbons, rags, socks and toys. 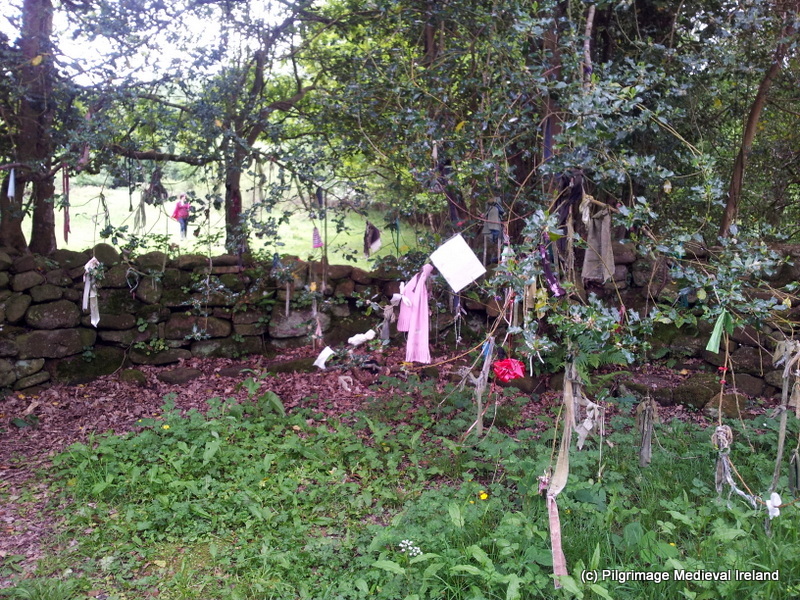 Rag tree at St Berrihert’s Kyle. 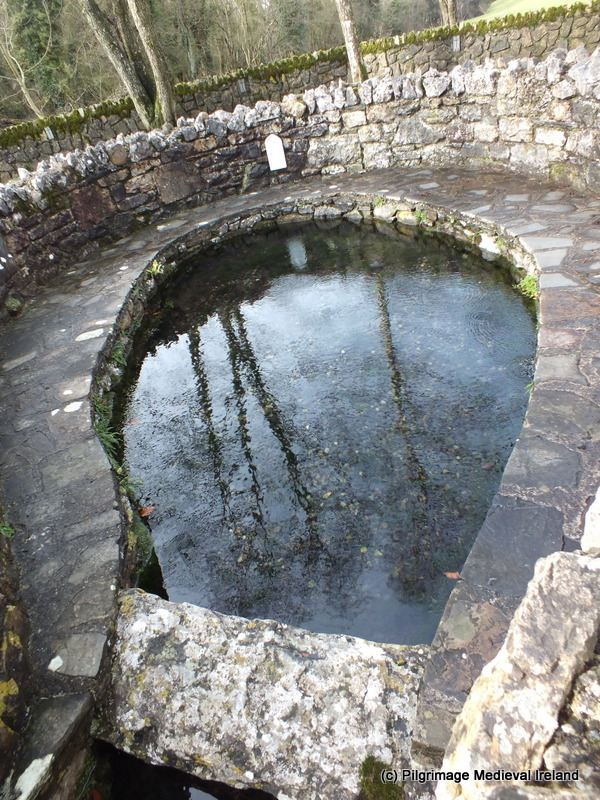 The well is formed from limestone springs and the waters bubble forth giving it a really magical appearance. This was very likely a place of prehistoric pilgrimage. 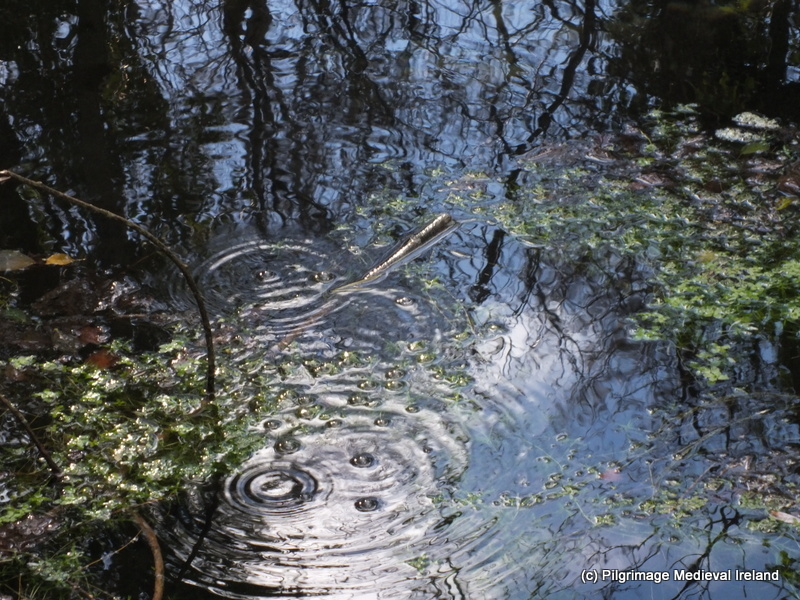 Bubbling water at St Berrihert’ well. 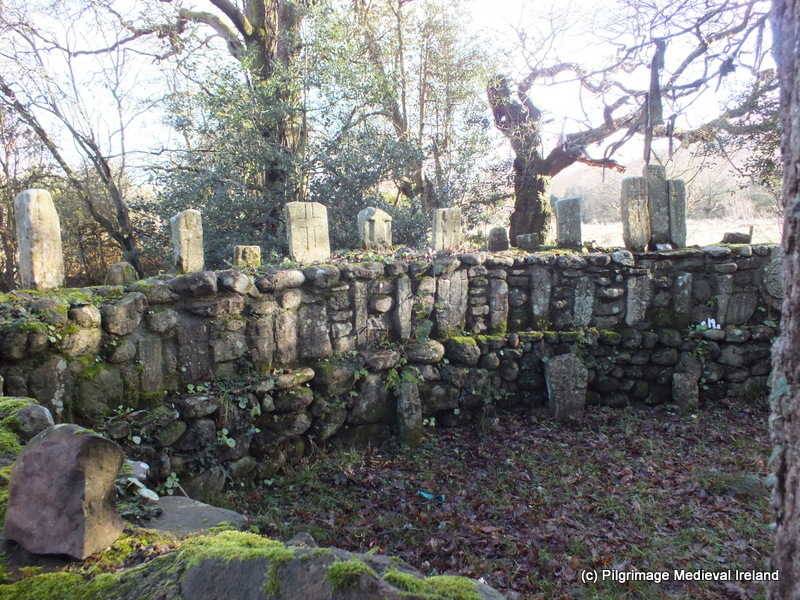 Coming soon is part II of this post, which will look at the history of pilgrimage at the site. Crawford, H. S. 1907. ‘A descriptive list of the early Irish crosses’, JRSAI 37, 187-239. ÓHÉailidhe, P. 1967. 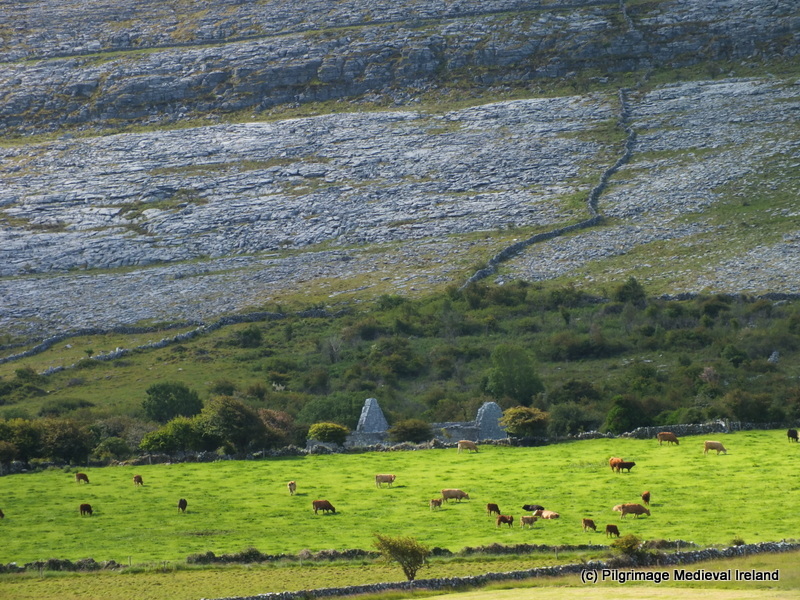 ‘The crosses and slabs at St Berrihert’s Kyle in the Glen of Aherlow’ in Rynne, E. North Munster Studies. Limerick: The Thomond Archaeology Society, 102-126.